Dell UP3218K it’s a 31.5-inch Ultra HD 8K monitor, with a resolution of 7680×4320 pixels at 60Hz. As a result, it is able to fit four times more content than an Ultra HD 4K display and 16 times more content than a Full HD display. The display also has a view angle of 178 degrees which is quite impressive.For the color gamut, you will get 100% Adobe RGB, 100% sRGB, 100% Rec709, 98% DCI-P3 and >80% Rec2020 with the UP3218K. To put it simply, the display will be able to produce beautiful colors that are true-to-life and look simply amazing. The monitor also comes with Dell’s PremieColor and it’s able to produce 1.07 billion colors, according to Dell. The monitor also has a very sleek design with very thin bezels — a 9.7mm thick bezel, to be exact. As for the ports, you will get 2 DisplayPorts (1.3), one microphone jack, 3 USB 3.0 ports, and another USB 3.0 port with BC1.2 charging capability. Dell UP3218K comes at a price of $4,999.99. Yes, that’s 5 thousand US dollars — and that may not be a high price for a powerful display like this. The device will be available from the 23rd March. Dell has also announced its new HDR feature³ to enhance the visual experience through a wider range of colors for exceptionally vivid images, higher clarity with visibly vibrant textures and increased contrast to capture a multitude of natural shades and hues. 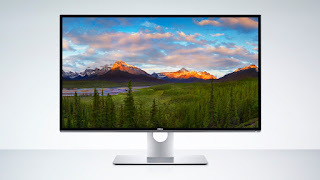 New monitors with the HDR feature include: the Dell 27 Ultrathin Monitor with a contemporary design, the world’s thinnest profile in its class, InfinityEdge display, Quad HD technology and USB Type-C connectivity as well as the Dell 24 and 27 InfinityEdge Monitors, which also feature dual 6W external speakers professionally tuned by award-winning Waves Maxx Audio.